It’s been a long, cold winter in the Southern States, with temperatures, rain and wind testing people’s resolves and tolerance levels, not to mention our outdoor structures! 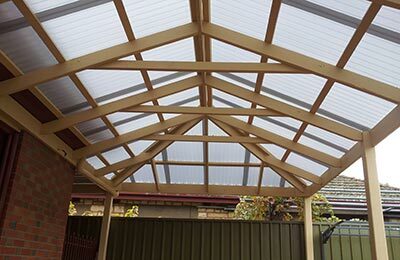 So, with the warmer weather just around the corner, it’s time to give your outdoor structures, such as your Adelaide pergola, the once over and fix any issues. If you have been noticing some rattling in strong winds, chances are it’s a roof screw or nail that’s become a bit loose on the roof of your Adelaide pergola. Identify the culprit and give it a few taps with a hammer or tighten the screw with a cordless drill. While on roof matters, also take the time to have a good look at your roof. A simple issue such as a tile that’s moved is simple to fix and could save you lots of hassles and money. Go over all of your outdoor structure and look for any signs of distress – flaking paint, corrosion or other issues. It’s best to fix an issue when it’s minor than leave it until its too late and an entire post or beam needs replacing. Check your gutters to make sure they are clear of debris and the rain is flowing into downpipes, where it belongs. If you’re Adelaide pergola has a timber deck, take a look at your deck to look for issues such as raised nails or screws, rotting deck timber or any other issues. Also take a closer look at sealant – whether its oil or paint – and if required plan to add another coat or two when the weather turns favourable. Take the time to do these simple checks now and you’ll be able to use your outdoor living area for what it was designed for when the weather turns nice – relaxing and entertaining!